Teenage social outcast Peter Parker spends his days trying to unravel the mystery of his own past and winning the heart of his high school crush, Gwen Stacy. The untold story of the legendary web-shooter unfolds in the blockbuster Amazing Spider-Man films, directed by Marc Webb. 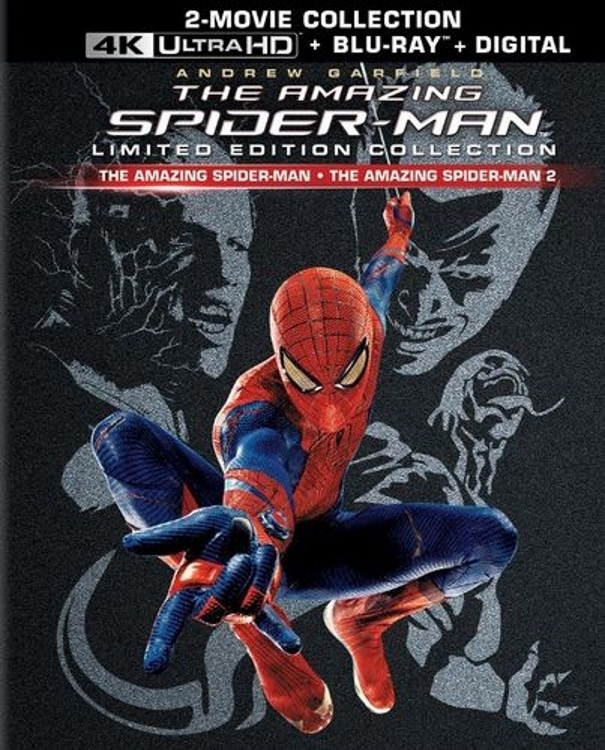 The saga begins in The Amazing Spider-Man, as Peter Parker (Andrew Garfield) becomes Spider-Man and balances being a superhero doing battle against the villainous Lizard alongside his developing relationship with Gwen Stacy (Emma Stone). Then, when Spider-Man's new enemies—including the powerful Electro—unite in The Amazing Spider-Man 2, Peter Parker finds that his greatest battle is about to begin. Packaged in a limited edition collectible 24-page Digibook featuring photos and behind-the-scenes detail. Based on the Marvel comic book by Stan Lee and Steve Ditko, THE AMAZING SPIDER-MAN™is directed by Marc Webb from the screenplay by James Vanderbilt and Alvin Sargent and Steve Kloves, and a story by James Vanderbilt. Stan Lee, Kevin Feige and Michael Grillo served as executive producers, with Laura Ziskin, Avi Arad and Matt Tolmach as producers. The Amazing Spider-Man 2 is directed by Marc Webb from a screen story by Alex Kurtzman & Roberto Orci & Jeff Pinkner and James Vanderbilt, a screenplay by Alex Kurtzman & Roberto Orci & Jeff Pinkner and based on the Marvel Comic Book by Stan Lee and Steve Ditko. E. Bennett Walsh, Stan Lee, Alex Kurtzman and Roberto Orci serve as executive producers with Avi Arad and Matt Tolmach as producers.